The Solution to worry is Trust! Our current dilemma can seem all encompassing and overwhelming. Yet, no problem is permanent. One factor that helps us deal with today’s diffuculties is remembering that everything in this life is temporary and will pass. This realization can add a measure of tolerance to the situation, whatever it is. Furthermore, turning things over to God is an effective way to deal with them. Successfully putting ourself and our problems in God’s hands changes us and our situation. This healthy way of dealing with challenges has a nametag: It is called trust. Knowing we should turn things over to God and actually doing so are often -2- very different things. So if trust is the answer to dealing with our problems, then how do we do it is the question. How do we turn things over to God? How do we trust Him? 1- SURRENDER. We tend to take everything figuratively. This is advice we should take literally. Get actively on your knees in the morning, the very first thing. Offer yourself, your assets, problems, your very will, your whole life, to God. If you feel that you can not give yourself away to God. Pray for His help in this act of surrender. I am not the only one that talks about surrendering to God, as a way to a life of spiritual victory and peace. Still, that surrender word does not work too good for me. Surrender is what you do, when you are beat by an adversary. And I see God as our Creator Parent, not adversary. What I have found to work better, to establish and deepen a relationship with this Holy Living Eternal Being is submission. When we allow a doctor to treat a wound, we do not surrender to them. We submit to their treatment, because we know that what they are doing is in our best interest and welfare. And so it is with God, we submit to Him, because what He can do and does in our life, is wonderful and for our good. 2- FAITH. What a terrible jumping off point surrender or submission would be, if we make ourself powerless with no recourse for renewed strength. Marx said religion was an opiate to the masses. When it is just a cultural observance, his statement proves true. It must be more than that, to to be honest and real faith. Faith gives ourself to another. That is a lot more than just an observance. That is why it must be done, before trust is realized. When the human heart is given to a God more powerful than we are; then faith is not an opiate but a rocket. Knowing God’s miracle power can catapult the soul into realms of goodness that only God can make real. Have faith. real faith, in God. 3- RELEASE. This is perhaps the greatest stumbling point for all of us in finding God, as the solution to our problems and worry. God is able to handle it, if we will take our hands off of it. Sometimes the parent must tell the child: “Leave it alone, till I can fix it.” It is only this kind of release in letting God have the situation and letting God have us; that we enable Him to work in the fulness of His power on our behalf. At the end of your day, literally get on your knees and let your problems go to God. Your future is best left in His hands. Release yourself to God. Let Go and let Him have you. someone else. So, If you surrender to God, have faith in Him and release your worries; release your very life to Him. This is trust! 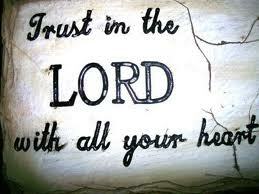 You will find that God will reward your trust with spiritual blessing & peace. This entry was posted in Bible Related, Faith & Inspiration, Slamism and tagged facing problems, faith, Morning prayer, night prayers, peace, Prayer, Problems, Slamism, solutions, Trust, Worry. Bookmark the permalink. 3 Responses to The Solution to worry is Trust! Very good post Tim 💛🙏Total commitment to God in all our ways. Thanks a lot Valerie. So nice of you to visit my site. God bless you bunches!